Craps players must "shoot" the dice the length of a Craps table and off a textured backboard so that they rebound before coming to rest. These rules are meant to prevent controlled throws that change the odds of specific numbers being rolled. It would only take a slight change in these odds to tilt the bias of the game into the shooter's favour. It is a fact that dice can be controlled in the private game, but under casino conditions it becomes a much more complex prospect. Players are said to develop a rhythm of holding and throwing the dice in the same set way, consistently. Hence the name Rhythm Rolling. The essence of the technique is to give a false rattle of the dice using the Lock Grip, while holding specific numbers together using the Dice Setting technique, and to get the dice to spin like a wheel around one axis when travelling through the air to the backboard, and then not to let the dice turn on the other axis on the rebound. That's a pretty tall order. This cartwheel motion of the dice will eliminate two sides of each die from landing face up and so totally changes the odds. If the dice are picked up and held in a Lock Grip then the sides of each dice facing each other and the two opposite sides can be prevented from coming up. It would be a good idea to practice this in your own time. The technique of spinning the dice around one axis is definitely achievable. The rebound off the backboard is the problem. It is possible to purchase the back-rail material privately, and if you want to perfect this technique it would be a good idea to do this, so you can practice freely. If you can somehow get free access to a professional Craps table, even better. Either way, be prepared to spend some considerable time practising your shots before you try them out with real money. There are many different "grips" (ways to hold the two dice with your fingers), but the only ones you really need are the Lock Grip and Blanket Roll Grip. You can find allsorts of other fancy grips described on Craps websites, with fancy sounding names and peculiar-looking finger positions that are all supposed to have their advantages, like reducing skin friction and so on. None of them are superior to the very natural looking and feeling Lock Grip and proven Blanket Roll Grip. These grips allow you to set the dice inconspicuously and then throw them with the spin you want, to prevent the outer/inner values landing face-up . 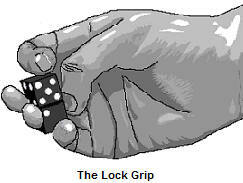 Let the dice "roll" from your hand as you toss them with the right force to just reach the back-rail. The dice should be already turning as you open your hand to release them and let them "spin" through the air to the backboard. The essential skill is to keep your hand and the dice horizontal and parallel with the Craps table's top and not to have too much of a rebound. When throwing the dice, lean over the front of the table as far as you can and reach your arm out to its full extent. This is to reduce the distance the dice travel through the air. Remember, the dice should fly to the backboard, don't let the dice bounce across the table. You want to develop your throwing technique so that the dice have enough momentum to hit the back-rail but not bounce back too hard. If you know Craps odds, then you know the shooter has a 1.41% disadvantage. This means you only need to get around two controlled throws right out of about 100 to tilt the odds back into your favour. And of course, your going to have to make smart bets that don't have a significant House edge. See good Craps play for a guide to the kind of bets you should and shouldn't make. Make sure your hand is dry and not sweaty. You can keep some chalk dust discreetly in your pocket to ensure this. Keep your thumb out of the way of the dice when you release them. And try and make your throwing technique seem natural and not controlled. You won't be prosecuted for controlling dice throws, but a casino can refuse your custom if they want, and they may well do so if they think you are successfully influencing the dice. Lastly, remember to practice and practice until you're confident about your ability. Only then should you gamble your hard cash at the casino tables. A commonly cited way to set the dice, when Rhythm Rolling or using the Blanket Roll, is to hold the two dice with the 3s facing-up and with the spots in a "V" shape. This is supposed to reduce the chances of rolling a 7. Remember, you only want to do this after the come-out roll, when you are shooting for your point number. 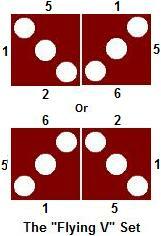 The "V" shape is a very convenient way to remember the dice-set, but it is more properly described as holding one combination of either the 6 or 1 on one die facing a 5 or 2 on the other. You are much better off learning the full dice setting technique, which will mean setting the dice quicker, less conspicuously, and with the full range of sets at your disposal for different situations. See Dice Setting for full details. There is a small industry that has grown up around teaching controlled crapshooting to the inexperienced player, including whole books and seminars dedicated to explaining the "secrets" of the Rhythm Rolling technique. All these commercial endeavours (because, of course, they charge a hefty price) are a waste of money. They will blind you with science, showing you mind-boggling, complex graphs and explaining percentages, spurious facts and dubious figures, ad-nauseum. Everything you need to know about dice setting and controlled shooting is explained on the dice-play website. Prove you can do it to yourself and don't take anyone else's advice, opinion or instruction on the subject. One piece of advice often given is, to bet on a shooter who is using the technique, who perhaps takes their time between shots, or who maybe tells you they can control the dice. The truth is, you have no idea whether they can control the dice or not. Practice shooting yourself and when YOU are confident with your own ability then place your money down on the table, but not before. There were in the past some casinos that used Craps tables that had a textured back-lining that didn't cover the bottom inch or so of the rail. The textured rubber lining was short on height. This definitely makes it possible to control the throw and outcome of the dice using the Whip Shot and Greek Shot. Casino's that used such tables were without a doubt cheated by smart unscrupulous Craps players. But casinos got wise to this trick and made sure the backboards where fully covered by the contoured rubber back lining. If you can find a casino Craps table like this today, you are onto something special and have the golden opportunity to make a considerable sum of money.